High School Receives High Honor for Design Transformation by LPA Inc. 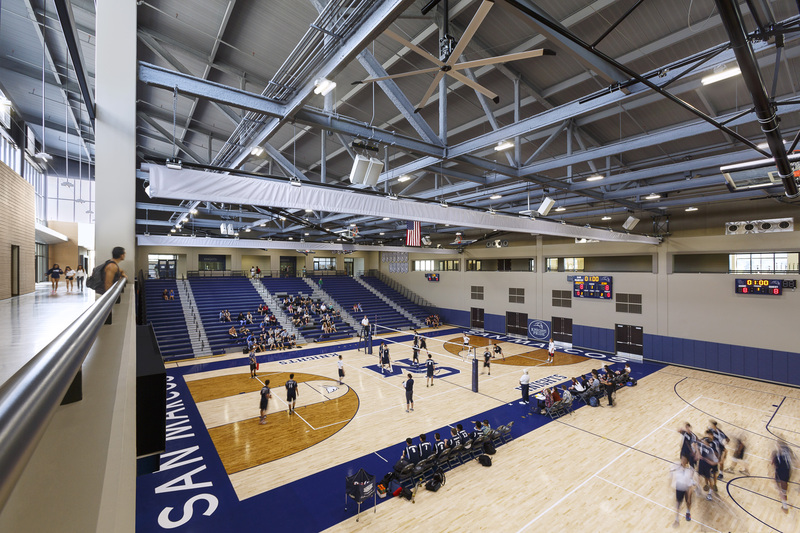 The award-winning sustainable design of San Marcos High School celebrates arts, athletics and academics. LPA was charged with bringing the oldest high school in the San Marcos Unified School District (SMUSD) into the 21st century. The project is well conceived as a 21st century learning center that integrates quality education opportunities with sustainable design. 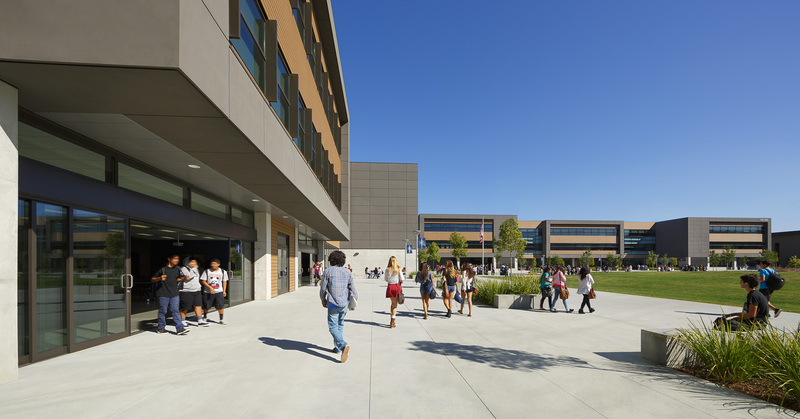 The Coalition for Adequate School Housing (CASH) and the American Institute of Architects California Council (AIACC) recently announced LPA-designed San Marcos High School (SMHS) has the distinction of receiving an Award of Honor. The award was announced at a ceremony during the 2015 CASH/AIACC Leroy F. Greene Design and Planning Awards Program in Sacramento, California last week. The high school was recognized in the New Built category. The planning phase of the 422,000-square-foot, 3,000-student enrollment San Marcos High School was a highly inclusive process involving multiple groups in meetings that varied in format from large presentations to informal workshops, charrettes and work sessions. Students, parents, faculty, school administrators, the community, and representatives from SMUSD were involved throughout the development of the design solution. 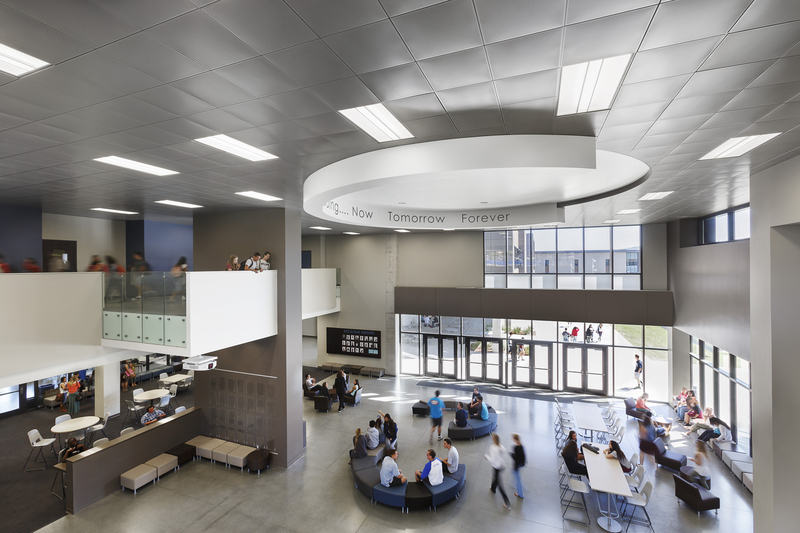 “LPA has been invaluable as we navigate[d] the rebuild of San Marcos High School. 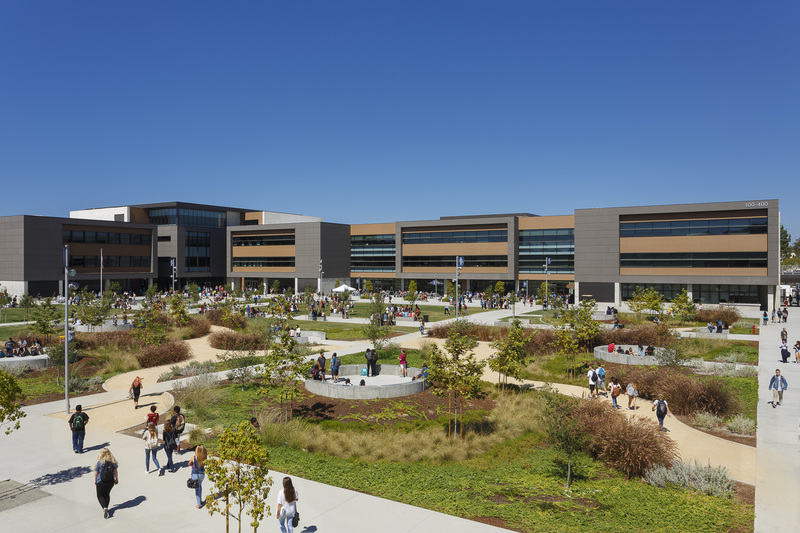 Their support of our educational vision is reflected in a campus that combines 21st century design with a commitment to academic excellence,” commented Julie Mottershaw, former principal of San Marcos High School. The idea of a multi-story campus around a central quad, to maintain the strong sense of community and maximize the available site area for school programs and amenities, was a direct result of this collaborative process. The campus consists of four major buildings. The “L” shaped academic building is a combination of three and four stories and contains a majority of the classroom space. The single-story “Academy” building includes shop studios, computer labs and laboratory space for the agricultural program. The Athletic Center has a three-court gym and multi-purpose weight room, dedicated dance/fitness studios and support space for athletics and physical education. Lastly, the Performing Arts Center includes a 400-seat theatre, black box theatre and support as well as teaching stations for the visual arts, media arts, band and choral. The main quad level of the campus is dedicated to student services with administration, student union, library, career center, ASB and food services all located along a circulation zone defined with large folding glass doors. These spaces will conduct students and staff around the perimeter of the quad and act as buffers between enclosed space and the exterior quad blurring the lines between indoors and outdoors. This integrated active learning environment is achieved while making students more acutely aware of their natural environment through educational signage that conveys the project’s sustainable strategies. Academic spaces are then stacked above the quad level and are connected via bridges, elevated walkways and stairs. Additionally, SMHS displays a wide variety of sustainable strategies aimed at providing healthy, efficient and productive environments for students and staff. The campus exceeds California Title-24 2008 standards by approximately 25 percent; native and drought-tolerant planting with natural bioswales used for stormwater treatment; daylighting is provided for over 90 percent of the occupants, including 100 percent naturally lit gymnasium spaces, coupled with direct and indirect lighting and controls, among other eco-friendly enhancements. Founded in 1965, LPA has more than 250 employees with offices in Irvine, Roseville, San Diego and San Jose, California and San Antonio. The firm provides services in architecture, sustainability, planning, interior design, landscape architecture, engineering, and graphics. There is no “Sustainability Director,” at LPA. Instead, more than 80 percent of the professionals are LEED accredited, including the Human Resources Director, CFO, and several other support staff. With extensive experience in public and private architecture, LPA designs a diversity of facilities that span from K-12 Schools, colleges and universities to corporate and civic establishments. More than 600 major design awards attest to LPA’s commitment to design excellence. For more information, visit LPAinc.com. The multi-story campus is located around a central quad to maintain the strong sense of community and maximize the available site area for school programs and amenities. These spaces will act as buffers between enclosed space and the exterior quad blurring the lines between indoors and outdoors. The Athletic Center has a three-court gym and multi-purpose weight room, dedicated dance/fitness studios and support space for athletics and PE. 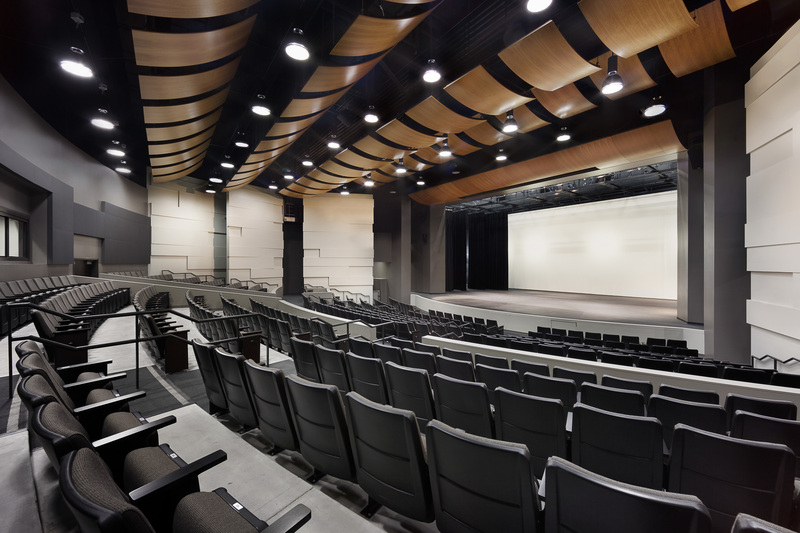 The Performing Arts Center includes a 400-seat theatre, black box theatre and support as well as teaching stations for the visual arts, media arts, band and choral. The integrated active learning environment is achieved while making students more acutely aware of their natural environment.